Sweet Fancy Treat: Why Do Architects Wear Black? Someone thought the answers and their variety should all be gathered in a book. So Cordula Rau, who also happens to be an architect, released a book on the subject. So what did she do? Over the span of a few years Cordula asked architects to answer the question, and had them write out an answer. For the book, she has compiled these scribbled replies as they were written by the architects, along with the translated version. Is this a stereotype just like the one which says architects only use black pens? If you asked me, I'll tell you this one is more than 80% true. And if it works with real ink, not just a liner, then it's the real deal. What do I use to write? Funny enough, the same thing. I haven't graduated yet, but the choice just came natural. 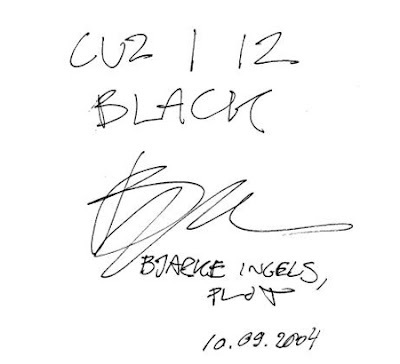 And if this is what they write with, why do architects wear black? Oh, and just for starters, architects weaing those black-rimmed glasses are such an invention, even more than fairytale unicorns. 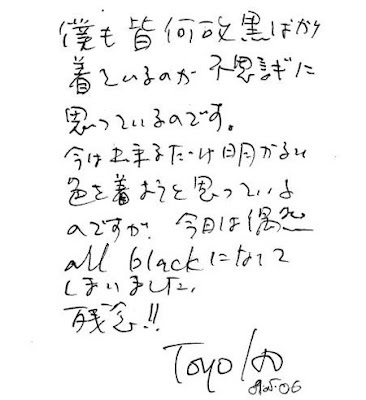 Toyo Ito is being honest: "I also wonder why everyone wears black. Nowadays I’m trying to wear bright colors, but today I’m all in black by accident. What a pity!!". Eisenman: “I don’t wear black” (lie, lie). Jun Aoki: “An architect is (still) a kind of communist”. Arno Brandlhuber: “They are in mourning about their many unrealized projects”. Now this could make sense... One word about it though: oouch! As much as I would love to read the book, all I could do was browse the net to find more quotes. I have no idea whether Zaha Hadid was asked the question. As far as i know, she is the one who does always wear black. And with amazing style. A short article about How Architects Dress that I posted in June 2008. Zaha Hadid also collaborated with Melissa, post from July 2008. Also, see her near Karl Lagerfeld inside their Chanel Mobile Art exhibit in a photo for Vanity Fair (December 2008). Off the record, Karl and Zaha make an excellent all-black creative duo, don't they? A short observation in what concerns my own way of dressing. And it was not made by me. I wouldn't have noticed it otherwise. The fact that I do wear a lot of black, or maximum dark-greyish clothes on when I work a lot on projects. Projects which involve creativity. It may also be the time factor to consider, mostly when it's running too short. The easiest thing to do is to jump into a bunch of black clothes and are ready to go. No more fuss about bright colors or how to match them. So, when I am wearing bright colored clothes clearly I had time to think about the stuff I put on. Also, time to snap photos. How else? So, why do we wear black? However you put it, black will always be the new black and nothing else can replace it. Do you think wearing black applies to all kinds of creative persons...ranging from fashion designers to photographers, writers, architects...? The common trait: letting the creation speak for itself. The pleasure of wearing black... One should search for no answers, one should just follow his feelings. Black is safe, is elegant, is easy to wear etc. But sounds too plain already. I suppose it's about the pleasure of playing subtle. 'Cause it requires more skills and wish in order to combine a couple of black hues. Black has slimming affect for fat people but for the rest it helps to concentrate.